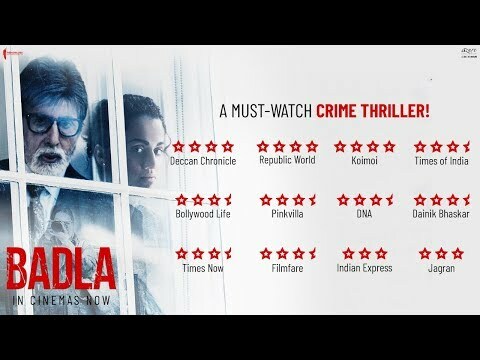 Cast: Amitabh Bachchan, Taapsee Pannu, Amrita Singh, Tony Luke, Manav Kaul. In this Hindi adaptation of the Spanish murder mystery, The Invisible Guest (with a gender twist), Naina Sethi (Taapsee Pannu), a powerful businesswoman, finds herself locked in a room, next to the body of her dead lover, Arjun (Tony Luke). With all evidence pointing against her, she seeks the help of the renowned legal eagle, Badal Gupta (Amitabh Bachchan), who in his 40-year illustrious career has never lost a case. Badal needs the "business icon of the year" to recount all the facts in just three hours so that he can prepare his defence and save Naina from her prison term. Her "attempt" at telling the lawyer her truth actually sheds light on the chain of events that took place. The film opens showing a man and a woman in a surreptitious relationship. Both are happy in their marriages but they are also "happy to seek pleasure" with one another. Of course, their affair comes to a grinding halt when they get involved in a car crash during one of their private getaways. Unfortunately for them, they find the situation spiralling out of control in Sujoy Ghosh's thriller, the premise for which was set by Oriol Paulo's The Invisible Guest. As different versions of the same truth play out over the next two hours, Ghosh gives you a peek into the real truth v/s falsehood, and arrogance v/s ignorance. As the filmmaker cleverly seeks to unravel the layers within the layers in people, he also very cleverly unearths the truth. And in doing so, he takes the viewer on a thrilling ride solving both the mystery and fallible human nature. To give away anything of the plot is a crime (far bigger than the one committed in the film). So, it should suffice to say that this is a 'clever' film and for those with a voracious appetite for whodunits, this should be a feast. The performances of Amitabh, Amrita (Rani Kaur) and Taapsee are competent. Bachchan cleverly brings to the table his cynicism, sharp wit and terrific timing. Amrita slips into the role of the grieving yet justice-seeking mother effortlessly. It is a pity that one sees so little of her. Taapsee, who has earned a reputation of being an actor who gives subtle and solid performances, continues to hold court. She was good in Pink (2016), Mulk (2018) and Manmarziyaan (2018), and she strikes the right chord here as well. Malayalam film import, Tony Luke's body is used more than his acting prowess. And Manav Kaul (Tumhari Sulu) is completely wasted. Shot beautifully at locations in Scotland and a couple of lesser-known exquisite UK holiday spots, this film is a big-screen spectacle because you can delight in the beauty of the snow-laden countryside. On the downside, the movie feels too verbose and claustrophobic because a major portion is set inside just one room. But, if you take a deep breath and let that feeling pass, you may just find yourself "digging deep" into the proceedings. 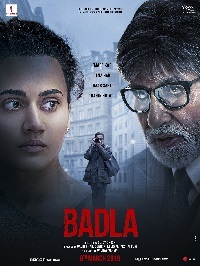 Badla offers a clever recipe for revenge. Definitely worth a try.